Not sure whether this was meant to be serious or more poking fun at the series, or maybe it was meant to be the final nail in the coffin of the Friday 13th series but it left me with a bitter taste in mouth for some reason. The movie had some potential and if it featured another villain... like say someone we didn't already know and love this movie would have been quite reasonable as a veg-out watch or something to do when hungover.. hell, its kinda fun, as far as B Grade horror goes, but as far as a movie that befits one of the most iconic horror characters of all time its a definite fail. Basically the pot revolves around a future team of space scientists (yes the movie is set in the space of the future) that stumble upon a cryogenically frozen Jason Vorhees and a would be victim from the early 2000's and the then proceed to thaw out the young victim who warns them about the potential horror Jason could unleash if brought back to life. The captain of the starship of course sniffs a few dollars out of Jason's corpse and decides to keep it. As you can probably guess the frozen corpse of Jason thaws out and he comes back to life to wreak havoc on the space cruiser. I have to say the film is shot quite well and the horror / sci-fi effects are actually pretty cool. 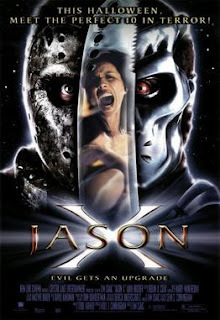 Someone took some reasonable time, and spent some reasonable money on this film, its just the plot is quite undigestable to anyone who's followed the series... the ship security team proceed to hunt down Jason onboard the ship and blast him to kingdom come, many times over which brings me to the next question, is Jason now immortal? he seems to regenerate at the drop of a hat, (sort of like the liquid terminator in T2) so basically you can amputate limbs or shoot him in the head, and he falls over but regenerates within minutes to start killing again. This does not sit right with me. Again if this was another character I didn't already know, maybe I could suspend disbelief but with Jason its hard. For more great horror movie reviews and stuff be sure to check out http://www.gorenography.com on a regular basis!